Tuned to the joyful tones of the alphorn melody from Brahms' Symphony No 1 in C minor, Reflecting the fields of Bavaria, this chime features a wheat image burned into the wood of the windcatcher. The Woodstock Chimes of Bavaria's enchanting sounds will be embraced whenever and wherever the wind blows. Material: Green wash finish ash wood, 7 satin green aluminum tubes, wood-burned wheat image on windcatcher. The German-born Brahms spent 15 years writing his Symphony No 1 in C minor, which he completed in 1876. 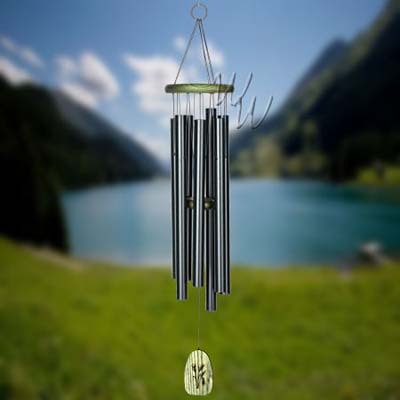 Reflecting the fields of Bavaria, this chime features a wheat image burned into the wood of the windcatcher. Materials: Green-washed ash wood, 7 matte green tubes.